“We’re seeing a dynamic shift in the relationship between business plans and logistics, a shift from the perception of our industry as a back-end process to a front-end strategy that informs and supports the entire business plan. I remember thinking, “Wow, that’s so true,” and I looked around the room and saw many nodding heads in agreement. It is why many companies at the time were still managing their transportation operations with spreadsheets and fax machines, and why many companies, not viewing logistics as a “core competency,” opted to outsource their logistics operations to third-party logistics providers (3PLs). I realized then that the wrong people were attending these conferences. The people who needed to hear the message that your supply chain strategy is your business plan and that logistics is a competitive weapon were not the people in the front lines of supply chain and logistics, but the CEOs and CFOs at manufacturing and retail companies. Yet most of those executives had never step foot in a warehouse or loading dock and would probably get lost trying to find it. Where are we today, fourteen years later? We’ve seen the rise of supply chain executives becoming CEOs, such as Tim Cook at Apple, Mary Barra at GM, Fabian Garcia at Revlon, John Hendrickson at Perrigo, and just this week, Bali Padda was named the new CEO at Lego. These leaders have visited many warehouses and loading docks, they understand the daily challenges those in the front lines of supply chain and logistics face, and most importantly, they recognize the strong link between their supply chain strategies and their business plans. And we’ve seen companies like Amazon truly leverage logistics as a competitive weapon, which is spurring others in the industry to do the same (see my recent post Defining Your Own Logistics Competitive Weapon). Yet far too many companies still view logistics as just a cost center, and far too many still use spreadsheets and fax machines to manage their operations. 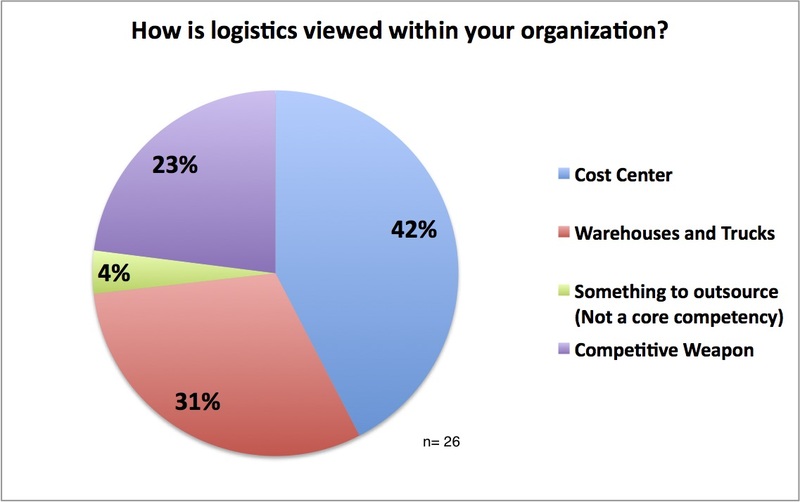 For example, in a recent webcast I participated in, I polled the audience and 42 percent responded that logistics is viewed as a cost center at their company and 31 percent said it’s viewed as “warehouses and trucks.” The bright spot was that 23 percent said logistics was viewed as “competitive weapon,” a much higher percentage than I had expected, and certainly a much higher percentage than would have resulted just a few years ago. 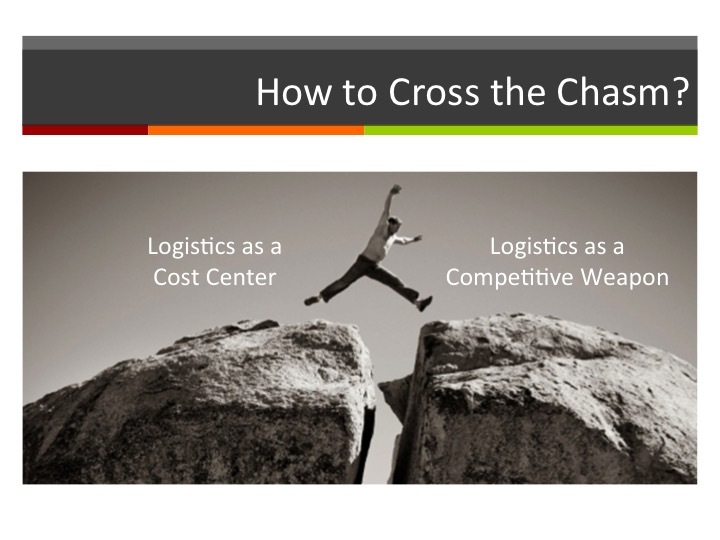 So, how can companies cross the chasm between viewing logistics as a cost center to viewing it as a competitive weapon? 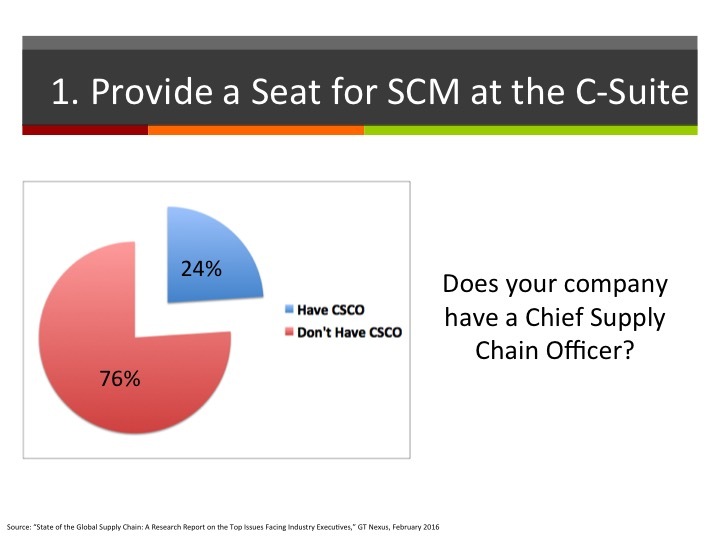 I encourage you to watch the webcast for my five recommendations, but here’s the first one: Provide a seat for supply chain management at the C-Suite. Simply put, if supply chain management doesn’t have a voice and advocate in the C-suite, you run the risk of having disconnects between your business plan and your supply chain strategy and capabilities. In the best case, those disconnects will cost you money and market share; in the worst case, in today’s highly competitive and dynamic business environment where there is less and less margin for error in strategy and execution, those disconnects will eventually put you out of business.